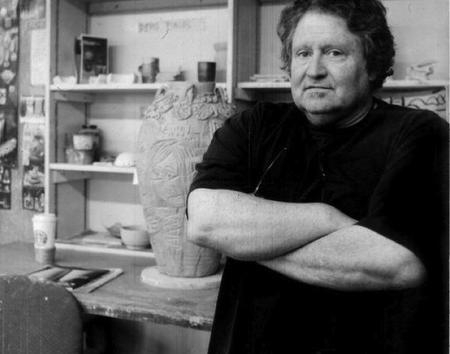 Kirk Mangus (1952-2013) was a prolific artist, whose work defied restrictive formal boundaries and navigated an array of traditions and practices. Celebrated as a master ceramicist, Mangus worked across multiple disciplines, including painting, drawing, and sculpture, and it is nearly impossible to separate one practice from another. 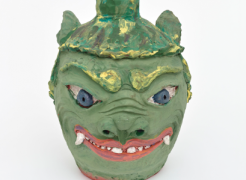 Unable to be neatly cast into one genre, style, or artistic tradition, Mangus’s work is characterized by his simultaneous use of traditional ceramic practices with contemporary subject matter and style, blended together with his unique levity and spontaneity. Mangus grew up in a family of craftsman, who were part of the burgeoning American studio craft movement that began to grow in the 1920s and even more so after World War II. Early on he was influenced by his parents, their teachers, and their peers who altogether created a rich community of international artists and craftsmen. Beginning an informal studio practice as early as high school, Mangus went on to study at the Rhode Island School of Design (RISD) where he continued to develop his craft. After RISD, he received his MFA from Washington State University Pullman, where he was greatly influenced by the prominent “Bad Painting” aesthetics of artists such as Patrick Siler. Through these disparate influences, Mangus became a skilled ceramicist, yet also felt at ease experimenting with and departing from more traditional forms of aestheticism and beauty. Mangus’s development is equally tied his physical environment as it was to his community. Throughout his career, he sought to utilize locally-sourced materials as much as possible, which ultimately became another variable onto the work. He and his wife, fellow ceramicist Eva Kwong, would collect clay from local sand pits and firewood from indigenous trees for their kilns. Because the materials varied in composition every time it was collected, this added an additional layer of chance, and gives each work a sense of place and uniqueness. Of his work, Mangus wrote, “I do a lot of drawings. Both on paper and clay. This work is about recording a gesture; putting down a mark… The ones that I like the best have a reserved or unfinished quality…they reflect the fact that the making process is a series of stopped events.” When viewing his work, this sense of immediacy, spontaneity, and stream of consciousness is evident, on whatever surface he had chosen. In his corporeal amphoric Femmes, he creates layer upon layer of slip and other glazes, giving the figures a life of their own. His ink paintings on handmade Mulberry paper recall Japanese calligraphic lettering while also have the expressive quality of action painting and the humor of the Chicago Imagists. Though his practice spans over four decades, the work has a fresh and contemporary quality, regardless of whether it was thrown in the 1980s or right before his untimely death in 2013. Driven by a singular desire to create, Mangus’s work possesses a sense of freedom, lightheartedness and spontaneity, grounded in his understanding of wide-ranging styles and traditions. Through his work, Mangus pushes the very distinctions between art and craft, and reconsiders traditionally accepted dictates of beauty that continue to challenge viewers today. Mangus’s work has been widely exhibited both nationally and internationally since the mid-1970s. His work has been the subject of numerous solo exhibitions, including a major career retrospective, Things Love, at the Museum of Contemporary Art, Cleveland in 2014. 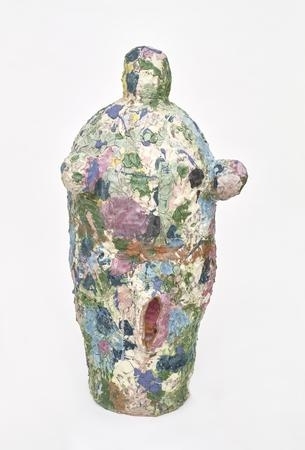 He has also be included in numerous group exhibitions at the Carnegie Museum of Art, Pittsburgh, PA; Akron Museum of Art and The Cleveland Museum of Art, OH; Seattle Art Museum, WA; Seoul National Museum of Contemporary Art, Seoul, South Korea; Gummeson Gallery, Stockholm, Sweden; and the Finnish Craft Museum, Helsinki, Finland. His work is included in numerous national and international collections, including Amsterdam Municipal Collection, Amsterdam, The Netherlands, Cleveland Museum of Art, Cleveland, OH; Cranbrook Art Museum, Bloomfield Hills, MI; DeYoung Museum, Sandy Besser Collection, San Francisco, CA; National Museum of Contemporary Art, Seoul, Korea; Newark Museum of Art; and the Northern Clay Center, Minneapolis, MN.